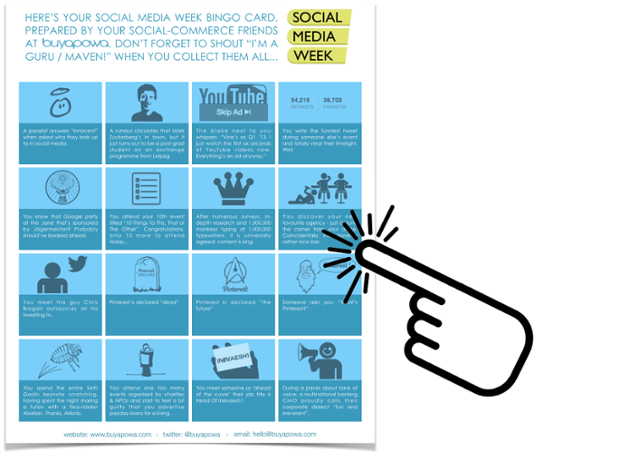 Social Media Week Bingo - Play NOW! 3. Attend as many events as possible at your friendly neighbourhood conference. 4. When you see things, tick them off on your card. Not any old things though – just the things featured on the card. Don’t tick off a pretty rainbow or a worrying mole on your forehead. 6. Feel very good about yourself. 7. Contact us about about your prize. 8. Feel sad about there not being a prize.